Even if I leave, you will never be President of Zambia,” President Edgar Chagwa Lungu has told UPND leader Hakainde Hichilema, according to Smart Eagles, a Facebook page run by Amos Chanda. He emphasized that Zambia is a nation steered by God and thus he would never let those with ill intentions take over. Lungu said some individuals have openly declared to set the country on fire for them to get to power. 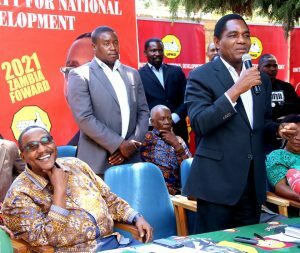 In reference to UPND leader Hakainde Hichilema, Lungu said he found it perplexing that they are bent on sabotaging government in order to show chaos and be a better option. “Some people have vowed that even by fire they will be President in 2021. They have vowed that they will want to bring this country on fire by 2021,” President Lungu said. President Lungu said he was elated that Zambians are already aware of their schemes. “All the schemes intended to bring chaos will not be allowed. If it means using a bit of force police will look into that… Zambians have seen who they are, they are evil schemers, they do not mean anything good for us,” he said. Even when we say we don’t want to fight or a war they are bent on fighting. And for them they want to plunge Zambia in chaos and then they say when they are in power they will show how much a better leader they are. How did this guy become President of Zambia? Sad! Police will enjoy arresting this self centred and misguided man. He is the worst thing that ever happened to Zambia since independence. What a joke for a President. HH has a greater chance to be President in 2021 than ever before. Lungu has mismanaged the country and has become very insensitive. I voted PF in 2016 but cannot vote PF again! And I am not ashamed to say this. The reason is simple. Whilst employees of UNZA, CBU, ZAMPOST, RTSA and other public institutions go about their daily lives without their March salaries, Lungu with his entire cabinet is busy dishing out money to voters in Luanshya and paying themselves hefty allowances. What the country now needs is a mass movement that was organized in 1990 of civil society, political parties, business people,farmers, students, academicians and trade unions to come together and begin to push for regime change. Enough is enough with the PF!!! We urge Zambians to unite across tribe and reclaim our lost glory from the thieving regime of Edgar Lungu. Lungu cannot stop us if we unite. For me as Zimbabwean who lived in Zambia during our freedom struggle, It is very interesting to observe the wisdom or foolishness of Zambians. The PF has made Zambians suffer even when they have an alternative leadership. Are they refusing alternate leadership on tribal grounds. If HH and GBM are being rejected by Zambians because HH is Tonga by tribe, that is very bad because it amounts to discrimination and is as bad as racism. If the situation continues maybe the Tonga should consider joining with us here in Zimbabwe because I think we could make a great country. There are already Tongas here in Zimbabwe. BA LUNGU DO NOT CHEAT YOURSELF, HOW MANY PEOPLE ARE SUFFERING WHEN YOU ARE BUSY DANCING AFTER BEING TOLD THAT YOU HAVE A BAG OF MONEY? WHEN PEOPLE ARE SUFFERING , EATING NOTHING BUT WATER EVERY DAY, YOU ARE BUSY WITH YOUR MALL IN IN A FOREIGN LAND BUSY BUYING TRUCKS FOR YOURSELF ON THE EXPENSE OF POOR ZAMBIANS. BUSY BUYING T.SHIRTS FOR CAMPAIGN AND GIVING POOR AND HUNGRY PF THUGS K20 EACH IN LUANSHYA. THOSE WHO THINK BY RECIEVING A K20 THEY WILL CHANGE LIVES FOR THE NEXT 5 YEARS. AN YET THEY JUST PUSHING YOU TO STEAL MORE MONEY FROM THEM AND THEY WILL BE MORE POORER THAN EVER BEFORE. Lungu is just but one voter who may not even vote for himself in 2021 even if he was to stand, he knows that the best man for the job and indisputably so is HH. Moreover, Lungu is not God to determine who becomes president of this great country taken over by rats. 2021 yena ikaba ni white wash ba Lungu mwilaibepa nokuibepa tata, tampeni fye nokusela pantu abena Zambia tatwaakamipanye, mwatwiibilia pafula! Prison will be your next mansion! Menomeno is a Muslim, and not a Christian. Understand him well. He is a troubled and sick person. He is scared to go in jail, once HH comes in power. He has a hate of a monkey. He doesn’t mean well to Zambia’s. He is full of corrupt people in his Government. What is Chitotela still doing in office, it’s because even him has been mentioned in account C. Shame. But he’s right to some extent. Given the regionalism exhibited in past voting patterns: HH can’t muster enough votes throughout the country to win the national vote. UPND, if they’re honest, may need to come up with an alternative compromise candidate NOW with wider appeal if they stand a chance of winning in 2021. This may not be a popular position but elections are about winning. UPND may need to ask this hard questuon but discuss it honestly. Where are the loyalties? To the individual over party? PF are the only ones that can mobilize that national level vote right now, win an election and damn us to another 5 years of corruption. I dont understand ECL. Worst still he is abusing the name of God. Maybe I will understand him in his death assuming he dies earlier than me. His mind sounds twisted with hate for HH. Is HH the only opposition Leader in this country that he should not sleep. He even comes up with laws targeted at an individual. I also get confused when I read Joshua Banda of Northmean Assembly club supporting ECL instead of condemning the violence, corruption perpetuated by PF. People are mocking God because of pieces of silver. The most powerful you should have in your hand is the truth. Politics of personal hate can not take the country forward. A true democrat should accept the fact that people can choose someone else other than me and life can continue. However we can see from Lungu’s outburst that he is not prepared for some people to take over from him. Is this man ok? Which normal Zambian would vote for Lungu, man and promote transparency in elections and see what happens? Lungu is everything that is wrong with Zambia today. Development, what development is he making reference to? Can someone ask him what the unemployment rate is today? Zambia with Lungu or Pf has no future!!! Lungu is one President Zambian forget about as soon as he leaves office. With Lungu, Zambia is dead! !